DEVICE TYPE: All solid state. MODULATION METHOD: Harris Digital, Patented. typical ambient temperature) 0 - 50°C. 70 ohms resistive, - j23 to + j18 reactive minimum, (greater ranges possible at specific frequencies). RF TERMINAL: 1-5/8", EIA flange. CARRIER AMPLITUDE VARIATION (Carrier Shift): 2% or less, typically 0.5%. RF SPURIOUS/HARMONICS: - 80 dB or better. TOTAL HARMONIC DISTORTION: 1% or less THD at 95% modulation, 30 Hz - 10 kHz at 5 - 10 kW, typically 0.3%. AUDIO INTERMODULATION DISTORTION: 0.8% or less 1:1, 60/7000 Hz; 1.3% or less 4:1, 60/7000 Hz; SMPTE at 10 kW, at 95% modulation, typically 0.7% at 4:1. SQUARE-WAVE OVERSHOOT: 1% or less at 400 Hz at 80% modulation. SQUARE-WAVE TILT: 3% or less at 40 Hz at 80% modulation. NOISE/HUM: - 65 dB or better below (typically - 70 dB unweighted). AUDIO INPUT: - 10 to + 10 dBm, adjustable transformerless input, 600 ohm, 150/50 ohm terminations also included. AM STEREO: - 35 dB 10M, 30 Hz to 10 kHz at 95% modulation (typically - 40 dB). PA AND OUTPUT EFFICIENCY: 90% or better. OVERALL EFFICIENCY: 84% or better. Typically 86% at 10 kW, 77% or better at 5 kW, typically 80% at 5 kW. 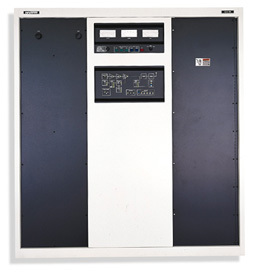 POWER CONSUMPTION: 11.9 kW or less at 10 kW, 0% modula­tion, 17.9 kW or less at 10 kW, 100% tone modulation. AC INPUT: 197 - 281 VAC, 3 phase, 341 - 468 VAC, 3 phase. ±10% from nominal volt. Maintains full performance. 48 - 63 Hz. REMOTE CONTROL: Capable, self-contained interface. RF MONITOR PROVISIONS: Up to 10V RMS RF modulated output sample (constant sample level at High, Medium or Low power set­tings). 5V RMS RF frequency monitor sample. AMBIENT HUMIDITY RANGE: 0 - 95%. AIR FLOW/SYSTEM: Forced air, exit top. SIZE: Unpacked: 78"H, 72"W, 33"D. Domestic Packed: 78"H, 80"W, 40"D. Export Packed: 84"H, 81"W, 41"D (161 cubic ft.). WEIGHT: Unpacked: 1 ,535 lbs. Domestic Packed: 1,675 lbs. Export Packed: 2,025 lbs.